While on the Internet, I spotted an Oodle alert for an estate sale in Old Fig Garden on North Del Mar, about a mile away from my former home. The e-mail caught my interest because in the list of merchandise, a “Steinway piano” was inserted among original paintings of Rollin Pickford and a Mercedes Benz. The ad was more than a temptation. I had to hunt down the piano and lay my hands on it! 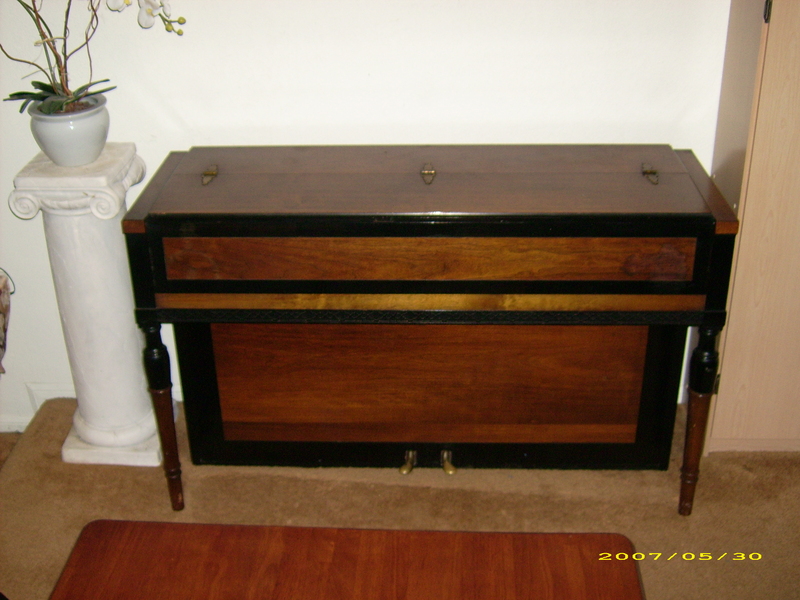 ESTATE SALE N. Del Mar (2 blks S/Shaw, 2 blks W/Blackstone) 12/4 & 12/5 8-3. Rollin Pickford Paintings, Orig. Art, Mid Century Danish Modern Furn., Leather Furn., Steinway Piano, Dansk, Pottery, Glass, Library, Good Bike, TV, Lrg. Wine Cooler, Bragada Bed, Refrig., Washer/Dryer, Mercedes-Benz Convert. SLK320, Comics & Misc. I surely didn’t need any more pianos to clutter my museum like space here in Fresno, and the El Cerrito studio was taken up by an imposing grand–but the minute a Steinway or Bosendorfer popped up anywhere, at any time, I’d drop everything I was doing and make a mad dash to the location. I’d be first in line. At 7:45 a.m. Saturday, December 4th, I was tagged #51. Though the sale began officially at 8, a throng of people had already gathered. One by one they patiently waited for and received their individual post-its with affixed numbers. In the meantime, jovial conversations were shared among them in the spirit of the holiday season. Immediately, I sensed that the piano was definitely not on anyone’s wish list. An eye catching silver Mercedes stole everyone’s attention– parked horizontally to barricade off throngs of people who might be drawn to this event. 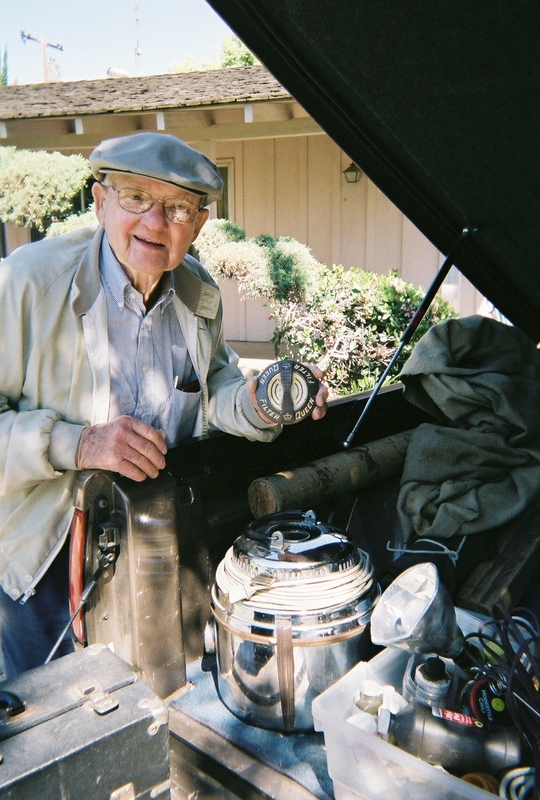 A nicely dressed man in his 80’s stood beside me imparting his passion for coffee grinders of all shapes and sizes. He boasted that he had acquired a 1700’s model that was passed down through a family at another estate sale. “Colorado” popped up in the conversation along with an internationally published “Newsletter” on coffee grinders. At this perfectly timed moment, I couldn’t resist making a quip about the program, “Antique Road Show,” as I effusively acted out my surprise to learn I owned a $300,000 coffee job– last frame, fade out and fade in to a heart throbbing owner of a vintage toilet seat. She was about to become a millionaire. But first, a break to fundraisers manning phones at PBS. Every time, there was a public TV promotion, I recalled the fellow who’d be on the air every year or so pitching his “Piano Playing in a Flash” collection of dvds and companion materials. I got queasy thinking about it. He claimed that private lessons taken over years, were basically a waste of time and money. He insisted that learning the piano the right and easy way amounted to banging out a few choice chords, espresso style, like a piece of cake wolfed down in a hurry. Okay, have your opinions, it’s a free country, I thought. But when the efforts of all piano teachers were trashed in two easy air-time minutes, I had to raise my voice in objection. So back at Del Mar, the line that formed for the estate sale, swelled to about 100 and eventually everyone moved quickly inside with eager anticipation. Upon entering through a narrow hallway, a small, black console piano sat off to the right in a good size living room with a high ceiling and wood flooring. It was a great acoustical setting for the miniature that had an authentic Steinway autograph on the fall board. (Not the fake, self-applied sticker-type emblems that graced too many privately sold pianos) Caveat Emptor! As expected, I came prepared with my Pierce Piano Atlas, the bible of piano information. It had a listing of every company known to mankind along with serial numbers and corresponding dates of manufacture. The volume was usually about 95% accurate, but occasionally, a date just didn’t jive. 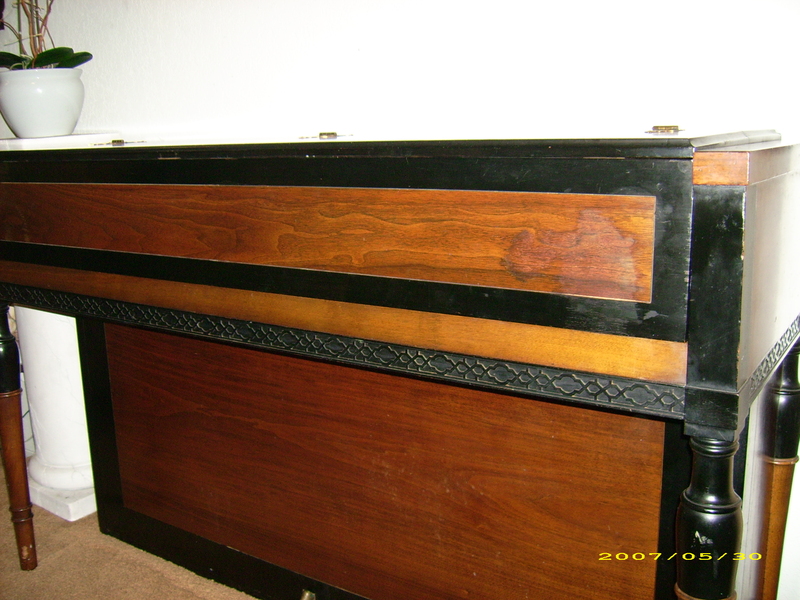 As a sidebar adventure, I’d purchased a beautiful Aeolian table-style spinet three years before that popped up on Craig’s List. It had a heavenly tone, and a to-die-for antique case with a filigreed rack though there was no sign of a serial number anywhere to correctly date it. Most often, you’d find about six numbers imprinted on the cast iron plate near the tuning pins but not so with the Aeolian that had become my latest obsession. It was no surprise then, that this plaguing piano addiction continued to rule my life like the force of a Tsunami. The true age of this particular enchanting piano had continued to haunt me even after it had secured a comfortable place in my home. The story was fascinating as it unfolded. A very endearing 85-year old piano tuner and long-term friend of mine, Connell York, examined the piano at my request, and concluded that based on its action, hammers, and casing, that it dated to the 1930s. He had actually slithered down one day, and lay on his back to properly examine the piano in detail. Quite a feat for a man of his age. Meanwhile I had sent a photo of the piano to an Internet maven who hosted the Bluebook of pianos.com, and based upon viewing it, he insisted the instrument was manufactured in the 1960s. Why the extreme gap in estimates between his and York’s? My growing frustration was about to get the best of me, if a definitive answer was not forthcoming. My quest for the right date became very prolonged and sometimes agonizing, but I assured myself that it was all worth the effort. As the journey progressed, Terry Barrett, my regular piano technician had come over to tune the Aeolian and address a sticking note in the bass. 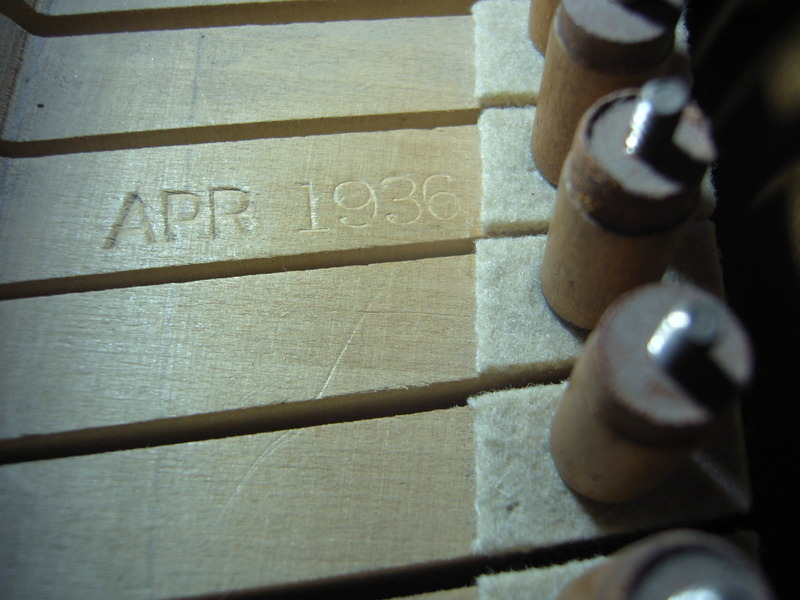 As he pulled out the action, there it was, serendipity, the date “APR 1936” imprinted on the face of a long wooden note, but not otherwise visible when the piano was closed up. Instantly, I grabbed my digital camera and photographed the key in all its splendor! I screamed, “Hallelujia!” That’s how powerfully the news affected me. It confirmed that this was not a 60’s made piano, or just another pumped out stencil. The ornamental beauty deserved a better identity and had rightfully earned the “antique” status it deserved! Immediately, I called York to congratulate him on his brilliant analysis and age projection! He was savoring every moment of praise that came his way, because in truth, tuners were overlooked, and trampled on for the most part, except in the halls of greatness like Carnegie, where a concert pianist groveled to find one who could realize the voicing and regulation so dearly desired. Flash forward to Del Mar, where the Steinway console needed to be claimed by a loving owner: It was time for me to properly evaluate it. The true test of a piano is playing it, listening to its tone, feeling the note to note progression, and the evenness of touch. That’s how I started my assessment. I depressed each key very lightly from the very highest to the lowest, gauging its intensity and voicing in relation to the next note. Upon my first inspection, I sensed that the Steinway piano had some weaknesses in the upper range, definitely showing its age. It had a conspicuous twang registered in a few octaves, but overall it possessed the Steinway shimmer and beauty of projection. I don’t know why at that moment, I didn’t break out my Pierce Piano Atlas to check the serial number but something about the instrument distracted me. Suddenly, it hit me like a bolt of lightning, that I needed to acquire a more complete understanding of the piano, by actually playing through a favorite piece. This was always the clincher in all my piano-finding excursions. It was the natural thing to do, to feel, play, shape a phrase, create a crescendo and diminuendo in order to test the piano’s responsiveness. As I sat down at the bench and played Beethoven’s “Fur Elise,” a crowd of people gathered with a sudden awakened interest in the little piano. In a state of bliss, I enjoyed caressing the keys, and merging with limpid phrases. I could have gone on indefinitely, encapsulated “in the zone,” not easily brought back down to earth. But all at once, out of nowhere, a burly man of about 60 intruded upon my Karma, and bullied me off the piano. “I’m the piano tuner,” he announced, in a brazen voice. 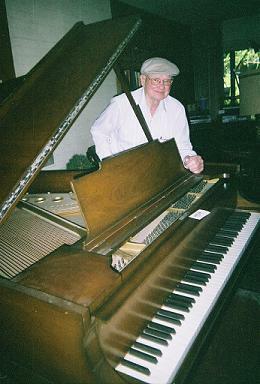 He quickly shoved me aside and opened the piano from the top, propping up Larry Fine’s The Piano Book that contained details about all pianos manufactured around the world. Indonesia, Japan, China, were now the big producers, having bought out formerly reputable New York companies. In my humble opinion, they produced pianos without the same finesse and high standards set earlier in the “golden years” of manufacture. In any case, I was taken aback by the tuner’s belligerence, though I still harbored an interest in the results of his piano inspection. “So how old is the Steinway?” I asked in a very forward manner. It sat no more than 40 inches from the ground so it couldn’t be anything else. Yet the technician contradicted me. “It’s a studio upright,” he bellowed! This last statement I knew to be totally fictitious. 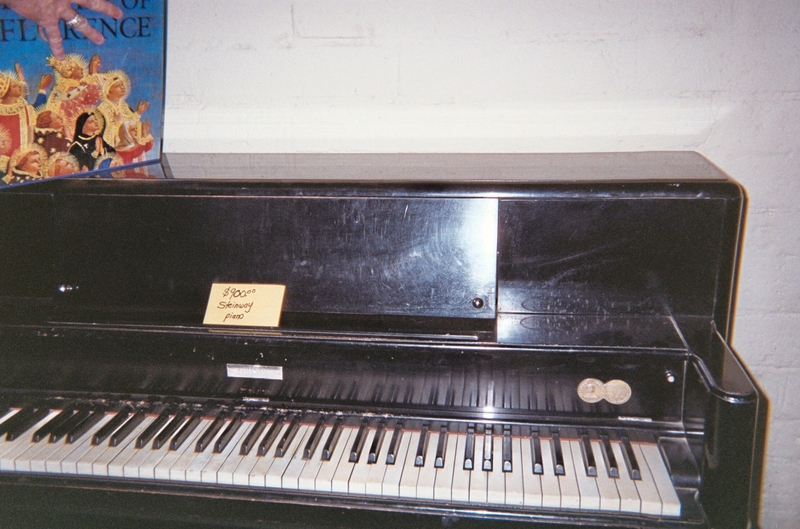 I owned a Steinway “studio” upright that was far taller than this piano I was staring at. Wasting no more time deliberating over what I knew was claptrap, I drove home to call York. In my opionion, he was the expert on pianos from soup to nuts and besides the old man was infectiously passionate talking about pianos or anything related. Since the Steinway was located only blocks from his house, he had no problem taking a three-minute drive over to the location. And he’d promised to phone me to provide details about the piano’s age and model type. Not Forty-five minutes later, it was déjà vu all over again. Hallejulia! York and the trumpets resounded! The little Steinway piano joined the Aeolian in establishing its true identity! As I sat by the computer talking to York, I had my Pierce Piano Atlas sitting on the desk in front of me. After I’d checked the serial numbers he had recited, “335485,” I realized that his posited date of manufacture was right on target! 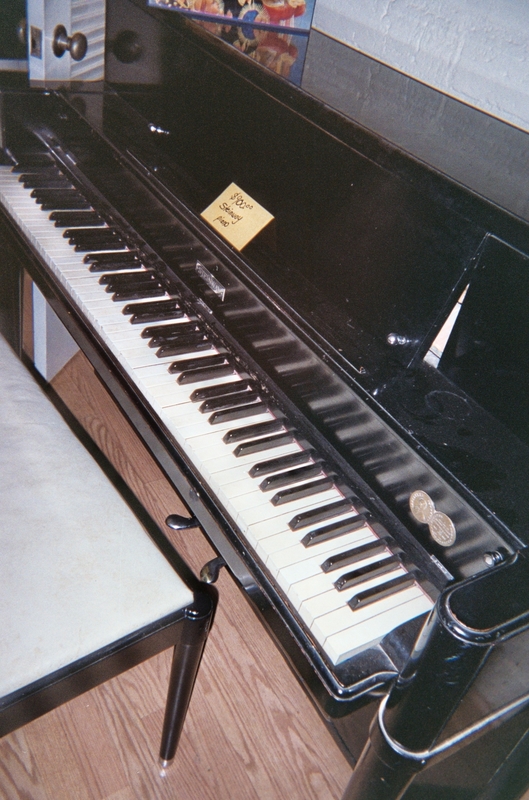 The Steinway console, having been officially born in 1951 would probably sit for another day or two at its temporary location. But if all went well. it would find a nice home with a caring owner. I was now ready to let go of it. The Steinway console and Aeolian style piano joined the family of pianos I had played and examined over the course of many years. Some of these precious instruments I’d evaluated for placement in the homes of students who were seeking their first piano, or who needed to abandon their electronic keyboards once and for all. 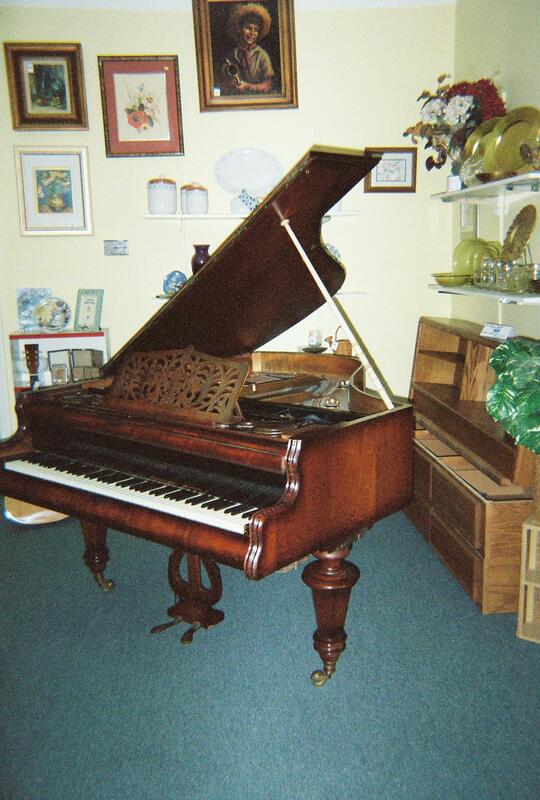 This last image provided, is an especially sentimental piano that I’d fallen deeply in love with. It was housed at the Discovery Shop of the American Cancer Society in Fresno, California. The photo below graces the wall of my piano room and warms my heart with every glance in its direction. It is a symbol of all the dream pianos that have turned up in the past, and will become living, breathing instruments in the future.